For more resources and additional information about this project, please visit www.BibleLandPassages.org. Synopsis: Situated some 690 feet below sea level, Israel’s largest fresh water lake and its surrounding majestic hills form the backdrop to some of our Lord’s most dramatic miracles. Complete with epic footage of the Sea of Galilee and compelling reenactments, The Power of Jesus in Galilee is a vivid and powerful documentary highlighting the miracles of Jesus in and around the ancient city of Capernaum and its environs. 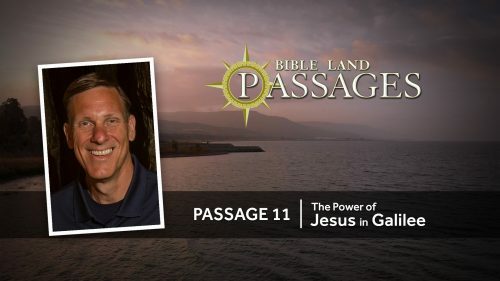 From the middle of the lake to the exploration of several ancient synagogues, Bible Land Passage filmmakers take you on a journey to where Jesus demonstrated his power over disease, demons, and the forces of nature. With a unique approach to examining and combining the archaeological evidence, geographical environs, and the gospel accounts, The Power of Jesus in Galilee will transport viewers back in time to a place where Jesus revealed his divine power. It will likewise show that just as the winds and the sea obeyed Him, so should we. Synopsis: Sitting on top of a hill overlooking the Valley of Elah, Khirbet Qeiyafa—the biblical city of Sha’arayim—serves as a powerful witness for the historicity of the Davidic monarchy. Occupying a strategic location near the border of Israel and Philistia, Qeiyafa offers a treasure trove of information about the United Monarchy and the specific beliefs and practices of ancient Israel. Recent critics have claimed that the kingdom ruled by David and Solomon was a tiny chiefdom. The evidence from Qeiyafa indicates that only a powerful king ruling a nation-state could have been responsible for the discoveries made there. Additional finds, such as the absence of pig bones and the incredible Khirbet Qeiyafa Inscription, highlight the ethnic distinctiveness of ancient Israel. Khirbet Qeiyafa: Witness to David’s Kingdom is a documentary that will strengthen your faith in the accuracy of Scripture and encourage you to live the distinctive life God desires for his people. Synopsis: Tel es-Sultan, the ancient city of Jericho, is the lowest city on earth. Prized for its natural springs and trade location, Jericho was a highly fortified city destroyed in a massive conflagration when the Israelites entered the Promised Land. The Bible reveals that its walls fell flat, and that the children of Israel marched up into the city and destroyed it by fire. However over the last one-hundred years, another great battle has been going on in Jericho; the battle over whether or not archaeologists have actually discovered the city destroyed by Joshua as recorded in the Bible. While a debate continues on the dates associated with the proposed city destroyed by Joshua, the evidence from the strata is compelling and fascinating. The archaeology of Jericho, coupled with the biblical account, has captured the imagination of many, but just as captivating is the story of a woman by the name of Rahab, whom God saved from the destruction. Her story is one of the rare jewels to truly be examined in this treasure trove of facts and information. Jericho: City of Rahab captures the essence of her life in a way that will encourage and inspire you. Synopsis: In the hot barren desert of the ancient tribal territory of Judea stands a gaunt and yet majestic plateau known as Masada. Rising some 1,300 feet above the Dead Sea, this natural island of defense is surrounded on all sides by rugged and deep canyon ravines. Thought to have been one of King David’s hiding places, this site was in the first century B.C. transformed into what was believed to be an impregnable palace fortress for King Herod the Great, and later would become the place for a legendary showdown between Jewish Zealots and their Roman nemeses. Masada: Fortress of Misplaced Faith is an excellent film which documents and explains through creative and powerful illustrations, photography and video the history of this historic site. The ruins of this modern national monument have today been unearthed and are a classic example of how archaeology has shown the Jewish historian Josephus to be a reliable source for the history of first-century Palestine. Bible Land Passages has assembled the evidence and information which testifies to the events and experiences of life during the time of Jesus and the early church, and the struggles of a nation seeking to maintain its identify. A must-see film with a much needed lesson about ingenuity, courage, and faith. Synopsis: The Southern Steps: Coming into the Presence of the Lord is a documentary explaining the significance of the architecture on the southern side of the Temple Mount during the days of Jesus. Recent excavations reveal the areas known as the Southern Steps, which worshipers would ascend to enter the temple, as well as the many immersion pools located near the temple. These are directly linked to the ministry of Jesus and the beginnings of Christianity, making this an important study for disciples today. Synopsis: Judah: David's Training Ground of Faith is a documentary about one of the ancient tribal territories of Israel and its relationship to the early life of King David. Filmed on location in southern Israel and in portions of the West Bank, the film examines the historical account and poetic literature associated with one of Israel’s greatest heroes, and how the terrain, climate, and environs of Judah served as an important element in shaping his faith. This Passage will forever change the way you read the Bible, and especially the Psalms. By watching this unique presentation on the interrelationship between the land of Israel and the people who lived there, you will find yourself being strengthened in faith and better prepared to meet your own personal trials and hardships. Synopsis: Treasures of Qumran: The Dead Sea Scrolls is a documentary offering the viewer a tour of the home of an ancient Jewish sect thought responsible for producing the Dead Sea Scrolls. We examine three magnificent treasures: the devotion of Qumran’s inhabitants, the place they called home, and the oldest copies of the Hebrew Bible ever discovered. Synopsis: In the Shadow of Gilboa: Reaping & Sowing is a documentary about epic events in the life of the Israelite people during the time of the Judges and Kings of ancient Israel. Filmed on location in northern Israel, this film examines several biblical events that occurred in and around Mt. Gilboa, Beit Shan, and the Jezreel and Harod Valleys. The lessons taught in these places offer truths as enduring as the beautiful settings in which they occurred. The achievements of Gideon and the tragic demise of King Saul are revealed in this thrilling documentary about what happens when you either sow to the Spirit or sow to the flesh. Synopsis: Dan: City of Unfaithfulness is a documentary showing the significance of Dan as a center of idolatry and unfaithfulness to God. Important aspects of Dan are explored. First, its location in the northern section of Israel helped to define the extent of the land controlled by the Israelites. Second, the modern site of Dan is important because of the archaeological discoveries that have been made. What archaeologists have unearthed really helps us to have a better understanding of both Old Testament life and the full veracity of the Bible. Third, the site of Dan is very important because of the evidence of idolatrous practices confirming the Bible's description of their unfaithfulness and loss of identity as God's people. Synopsis: The Ministry of Jesus in Northern Israel takes the viewer to three famous sites involved in Jesus’ public ministry: Cana, the Mount of Beatitudes, and Caesarea Philippi. In these locations, we learn of Jesus’ personal identity, his preaching, and his power over nature, and then we explore the significance of these events for 21st-century living. Synopsis: Jerusalem: An Unforgettable City is a documentary about the significance and grandeur of the ancient city of Jerusalem, and its relationship to biblical history and thought. Shot on location in Israel, this film examines the unique location, topography, history, and archaeological environs of what many consider to be the most important city in all of human history. Highlighting both ancient and modern history, Jerusalem: An Unforgettable City is an unforgettable film with an unforgettable message that will educate and edify the viewer.